It’s no secret that eating a generous helping of colorful fruits and vegetables every day is vital to good health. Not only does fresh produce provide essential vitamins and nutrients that keep the body running optimally, but it is also a proactive way to prevent a slew of chronic diseases. That said, if you are looking for a way to boost your nutrient content for free while reducing waste in the kitchen, you might want to set aside the peeler. Many fruits and veggie peels are loaded with extra nutrition and different antioxidants, but preparing these foods in the traditional way often means the skins end up in the compost. Instead of peeling away your nutrients, read on to discover the amazing health benefits of eating these fruits and vegetables – peel and all! A comfort food that is often seen as a carb-heavy plate filler, potatoes have gotten a bad rap since they usually come fried or processed, dressed up with gravy, cheese, sour cream, bacon, and other tasty (but unhealthy) toppings. And yet fresh potatoes sans fatty accouterments are quite healthful. They are low in calories (a medium potato contains only 168 calories) and are an excellent source of vitamins C and B6, phosphorous, niacin, magnesium, potassium, fiber, and zinc. They’re also pretty much fat-free. When you peel your potatoes, though, you’re missing out on all the extra nutrients that are found in the skin itself. An unpeeled potato is higher in fiber, calcium, iron, potassium, phosphorous, riboflavin, folate, and vitamins A and K than potato flesh alone. And while there are many ways to prepare potatoes, baking them is considered the best way to keep all those goodly antioxidants, carotenoids, flavonoids, and electrolytes within the spud. Boiling potatoes, for example, has the effect of leaching the nutrients into the water, but one way to prevent this is to keep the skin on! Abundant in beta-carotene, carrots are particularly lauded by doctors, dentists, and optometrists due to their benefits for the eye, mouth, and overall physical health. And it’s easy to see why: when ingested, beta-carotene becomes vitamin A, an antioxidant that strengthens the immune system, protects against free radicals, and lowers the risk of heart disease. While beta-carotene is found throughout this root vegetable, the outer flesh of carrots are unique in that they contain a few non-nutritive phytochemicals – namely, carotenoids, terpenes, and polyphenols. These plant compounds help protect against cardiovascular disease, cancer, type 2 diabetes, neurodegenerative diseases, inflammation, and other chronic illnesses. The presence of polyacetylenes found just beneath the peel, has shown promising results in clinical studies for its anticancer, antifungal, antibacterial, anti-inflammatory effects, as well as its ability to boost serotonin levels naturally. A member of the melon family, cucumbers are rich in potassium and fiber, low in calories, and are intensely hydrating since they are about 95% water. Also enriched with phytochemicals, cucumbers contain flavonoids, lignans, and triterpenes, all of which protect against cancer, cardiovascular disease, and inflammation. If you want to achieve these benefits in full, leave the skin on the cucumber – most of the nutrition is concentrated in the peel (as well as the seeds). Grow or buy organic to avoid synthetic waxes and the notably high pesticidescommonly found on conventionally grown cucumbers. Though the fleshy part of the apple is still a good source of dietary fiber and vitamin C, if you prefer to eat apples without the peel, you are sadly missing out on some essential nutrients. The peel is mainly responsible for the apple’s pectin content, as well as a suite of phytochemicals (quercetin, triterpenoids, phenolic acid, and polyphenols, to name a few) that help regulate blood sugar, improve breathing and lung function, and promote cardiovascular health. Preliminary studies on these phytochemicals also indicate that they may inhibit cancer, protect the brain against cognitive decline, and help to ward off obesity. As mentioned in our article on eating your purples, fruits and vegetables with blue, red, and purple skins contain a type of flavonoid called anthocyanins. These potent antioxidant compounds have been shown through various studies to reduce blood pressure, improve vision, and inhibit cancer cells. The purple eggplant is no exception. Its skin is enriched with anthocyanins, along with another nutrient called nasunin. Found only in the skin, nasunin has demonstrated the ability to protect against free radicals and cell damage. Eggplant skin is also plentiful in chlorogenic acid, another phytochemical that helps lower blood sugar levels while reducing the risk of developing type 2 diabetes, and may even induce weight loss, provide pain relief, and improve mood. Though the flesh of the eggplant is an excellent source of fiber, vitamins B1 and B6, potassium, folate, copper, manganese, and niacin; you’ll want to keep the skin on the fruit to get the full benefit. As a general rule, the older the eggplant, the tougher the skin, so try to choose younger (and smaller) fruits to cook with. Loaded with more vitamin C than an orange, kiwifruit is also a good source of fiber, vitamins E and K, copper, potassium, manganese, and folate. 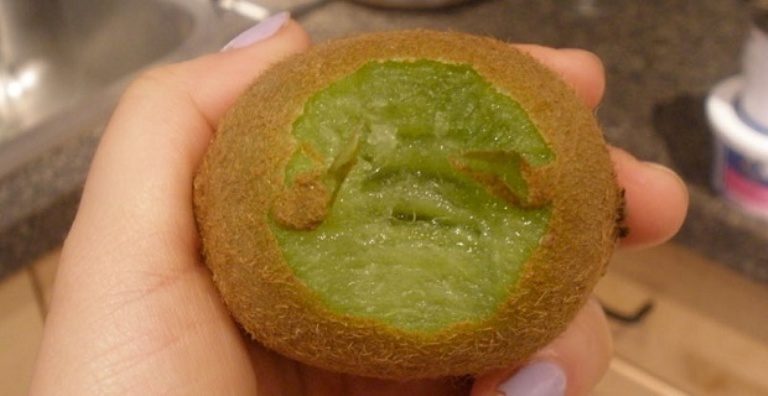 Though the conventional way to eat this verdant fruit is to carefully remove the skin or slice the fruit in half and scoop out the insides with a spoon, you might be surprised to learn the peel of the kiwi is entirely edible. Similar to a Bosc pear, the fuzzy brown exterior can be gently cleaned (and de-fuzzed) by rubbing it under cool water. Adding a bit of texture to this snack, the peel of the kiwi ratchets up its nutritional value, giving it three times the fiber and a major boost to its vitamin and mineral content. There are plenty of impressive reasons to eat mango since the pulp of this sweet tropical stone fruit is brimming with antioxidants – polyphenols, carotenoids, and ascorbic acid – especially the Ubá variety. Though there’s a lot of gain from eating the pulp, recent studies on mango peels have shown that they have a higher amount of flavonoids, carotenoids, anthocyanins, and polyphenols than the flesh, and these antioxidants were effective against several types of scavenging free radicals. The skin – and the skin alone – contains a compound similar to resveratrol that was shown to be effective in reducing body fat and preventing obesity. Some people eat mangos like they would an apple – by chomping in, skin and all. Depending on the mango cultivar, the peel can tough and somewhat bitter. If you dislike the taste and texture, chop up a ripe, thin-skinned mango and toss it, along with other fruits, into the blender to make a smoothie. Mango peels can also be pickled or grated into a zest for salads and desserts. A word of warning, though: mango skin contains small quantities of urushiol oil, the same chemical that causes adverse reactions after touching poison ivy and oak. While most people are unaffected, those with an urushiol sensitivity will want to steer clear of mango skins. If you can pick up an unpeeled mango bare-handed and have no reaction (itching, swelling, burning sensation), you’re good to go! Studies on the chemical composition of citrus fruits – lemon, orange, grapefruit, and the like – have revealed that those thick-skinned rinds are enriched with powerful antioxidants. Further examinations indicate that citrus peel extracts may improve insulin resistance and help lower cholesterol. Although no one would recommend eating citrus rinds as is, you can still incorporate the peel into food and drink to achieve these amazing health benefits. Citrus teas, extracts, and zests are the ways you can make use of citrus peels in your diet. Perhaps you already have a plan for those discarded banana peels, but finding a way to eat them up will provide a sizeable bump in nutrition. Like so many other fruit skins, banana peels are chock full of antioxidants; they also contain lutein (which is good for the skin and the eyes) as well as the mood-boosting chemical tryptophan. Instead of eating an unpeeled banana whole, here are five delicious ways to cook with the peel. The soft, juicy pink flesh of the watermelon usually gets all the attention, but don’t overlook the power of the rind! Frequently tossed away without a second thought, the firmer, mostly white portion of the watermelon is indeed palatable, and eating it will increase your intake of vitamins C and B6. Watermelon rinds are a natural source of citrulline, an amino acid which has antioxidant properties. Studies on citrulline indicate it may be useful as a treatment for erectile dysfunction and hypertension while helping reduce weight gain and lower LDL cholesterol. There’s no shortage of ways to include watermelon rind in your diet: it can be stir-fried, pickled, candied, or made into gazpacho, chutney, and pie. Toss rinds directly into the juicer to make a deeply nourishing drink.